“There is no part in football for racism and events like this to educate young people are essential. We have to work together to take it out, not just from football but daily life as well"
Doncaster Rovers Community Sports & Education Foundation and Doncaster Council worked in partnership with Show Racism the Red Card to organise an educational event at the Keepmoat Stadium for over 100 young people from local Primary schools. The event was officially opened by the Mayor of Doncaster, Peter Davies, who welcomed the pupils from Bentley High Street, Toll Bar and West Road Primary Schools and talked about the council’s support of the campaign and the importance of challenging racism. The Mayor said, “I want to pay tribute to the excellent work the Show Racism the Red Card Charity has done for over 15 years to educate and equip us to speak out and challenge racism of any kind. “The Council is working with Doncaster Rovers and Schools throughout the Borough to encourage people to respect each other and to learn that difference is not a bad thing. Together we can reject racism and promote harmony in society. Following the Mayor’s official opening address the young people were engaged in a number of educational activities examining stereotypes and a definition of racism. The pupils took part readily and contributed some excellent ideas to this session. The main part of the event followed, which included a screening of the SRtRC DVD and then a Question and Answer session with a panel of very special guests. Former professional footballers and SRtRC patrons Matt Murray and Ken Monkou were joined by DRFC manager Brian Flynn, club captain Rob Jones and midfielder James Harper, former Doncaster goalkeeper Jan Budtz and the Mayor Peter Davies. The panel were superb at answering a variety of questions on the subject of racism in sport and society. There were a number of prizes for the panel’s favourite questions of the afternoon which included SRtRC T-Shirts and mini-footballs, Doncaster Rovers goodies including stationery, footballs and sleeping bags! There were six prize winners in total and it was great to be able to reward so many brilliant questions. DRFC manager Brian Flynn said “There is no part in football for racism and events like this to educate young people are essential. We have to work together to take it out, not just from football but daily life as well"
Gavin Baldwin, chief executive of Doncaster Rovers said: “Raising awareness of racism among young people is extremely important — young people do look up to footballers so we hope that messages like this coming from the players themselves will make a real difference. 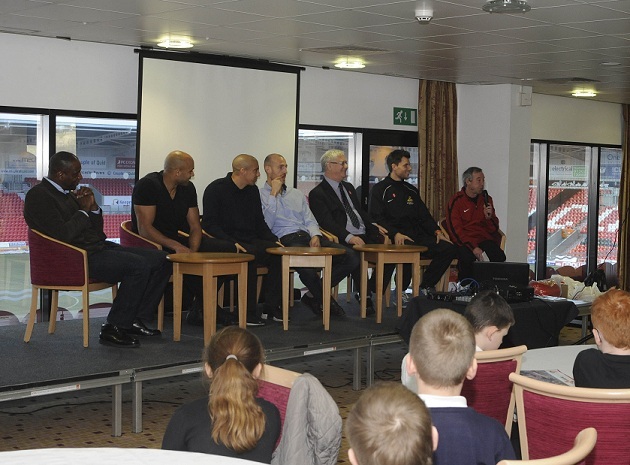 The event received coverage in Shoot magazine and also on the Doncaster Rovers FC website . SRtRC would like to thank Doncaster Council, Doncaster Rovers Community Sports & Education Foundation and Doncaster Rovers FC for all of their support for the event. We will look forward to more work in Doncaster in the future!